i just came on to see how this tournament was going so i could post it on the Beyblade tournaments Australia facebook page i created and suddenly see it's cancelled. it's sad to see an Australian tournament cancelled, expecaly a plastics one. sorry to see it go. It was a mix of poor timing and loss of interest of a lot of people, as well as the fact the tournament scene here is kinda dead. These things happen. The Dragoon G is $8.00, the Driger G is $10.50, with a bonus ripcord (TT Light Launcher 1 Ripcord, the long one) and launcher if you want. That's slightly less than what they cost me, and roughly the same price it'd cost you off ebay (both because paypal charges a currency conversion fee or similar), and adding in the ripcord and launcher on driger G makes it great value. Boxes are in that state because that's how they came, which is the norm when buying them (if they even leave it in the box at all). I've opened them to check the contents to make sure nothing is broken or missing or malformed, and they are all fine, and obviously they're authentic Takara Beyblades. If no one buys within a week I'll look at posting them or whatever, but yeah. I'd appreciate it, even if it's not much I could really use the money without paying paypal fees and so on, and shipping stuff is a pain for me. (Jul. 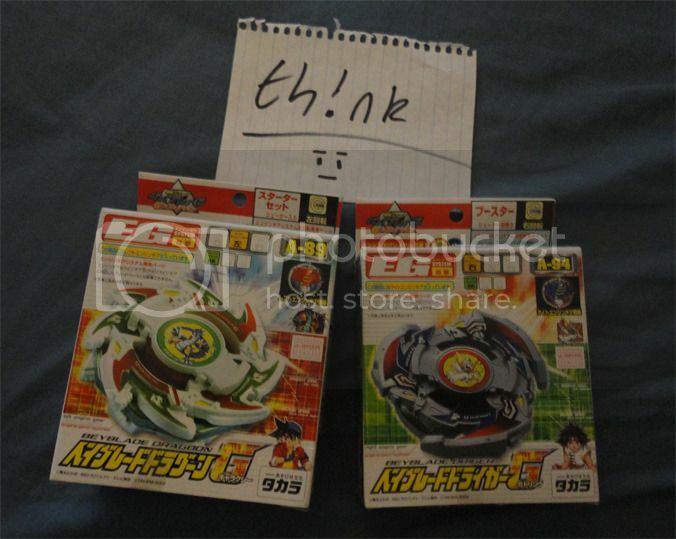 21, 2012 9:21 AM)Giraton Wrote: i just came on to see how this tournament was going so i could post it on the Beyblade tournaments Australia facebook page i created and suddenly see it's cancelled. it's sad to see an Australian tournament cancelled, expecaly a plastics one. sorry to see it go. Checked google maps...Thornlie looks is quite far from Bentley...I'm not sure if I want to make the trip there to get another Driger G hahaha, want one to use as my battling piece XD. Apparently it's about 20 minutes. If it's still too big a trip, in about a weeks time I'll open them up for postage so if no one else buys it before then I'll let you know? Ahhh man, sorry Th!nk...I would've wished you the best of luck. But now you get nothing. It's okay, haha. I would've liked to have given my ez shooter power custom and weight based defender a nice work out, but really I'm only sad I couldn't revive Perth for plastics. I will try to get something together at a more convenient date and time for everyone else eventually.